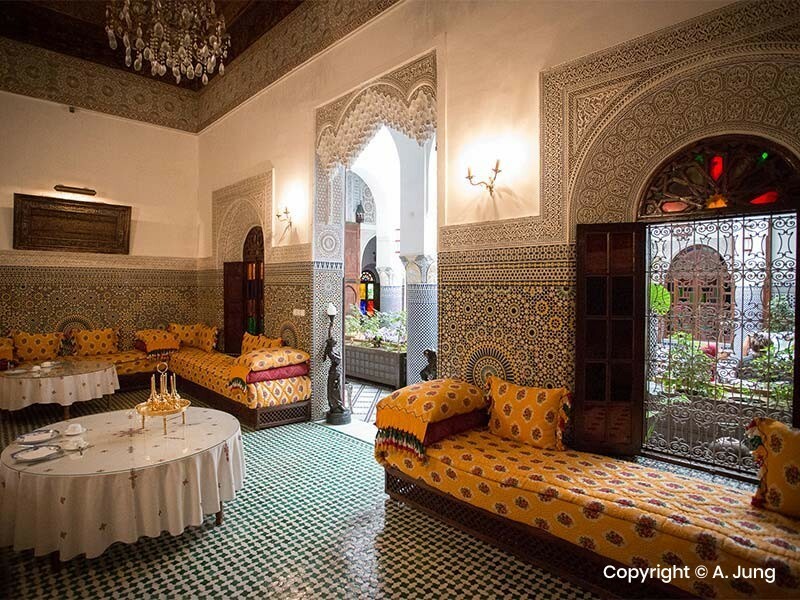 Our private tour begins with a transfer from the airport to your hotel in Casablanca, where you’ll be offered a complimentary meal. Today depends on the time your arrival; given the time we may explore a handful of Casablanca’s touristic features such as the Hassan II mosque, Moroccan Mall shopping center and a nearby beach area. Today we’ll explore a handful of Casablanca’s touristic features such as the Hassan II mosque, Moroccan Mall shopping center and a nearby beach area. 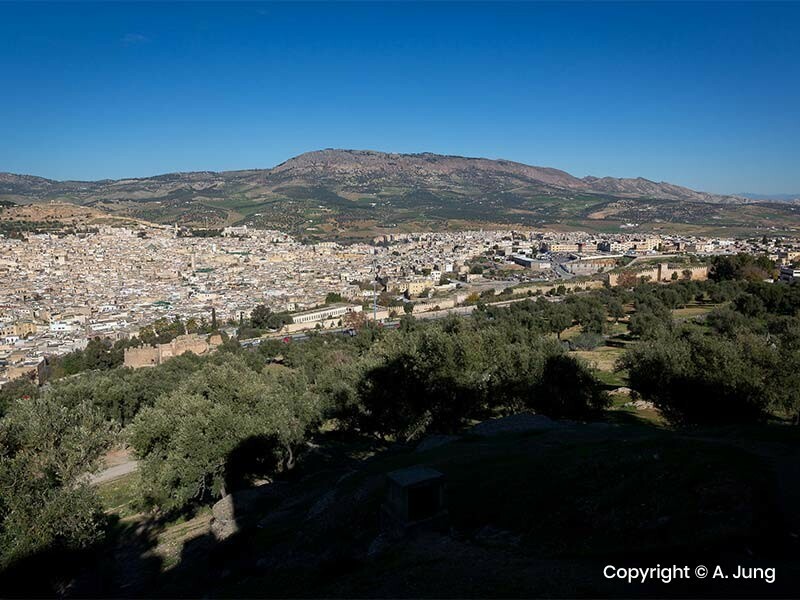 After lunch in the city we’ll drive to Meknes, a former imperial city. 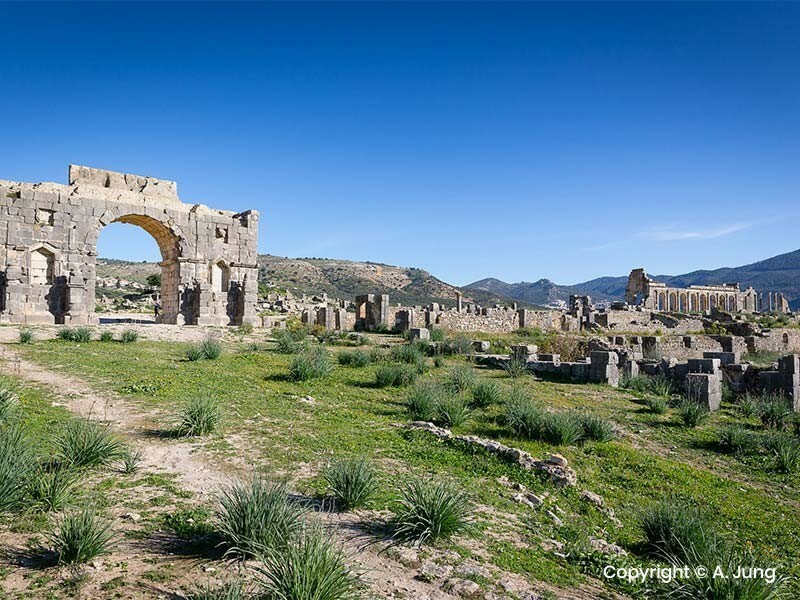 Next we’ll visit the ancient Roman ruins of Volubilis before continuing to Fes where we’ll spend the night at a local riad / hotel (including a complimentary dinner and breakfast). Today after breakfast we drive towards Ifrane, called as ‘the Switzerland of Morocco’. We continue to Midelt and then we pass along the Ziz valley to reach city of Erfoud ,very famous for its local fossil products. We continue our private desert Morocco tour to Rissani to explore its souk. After that our journey finishes in Merzouga where we stay in desert hotel with dinner and breakfast. 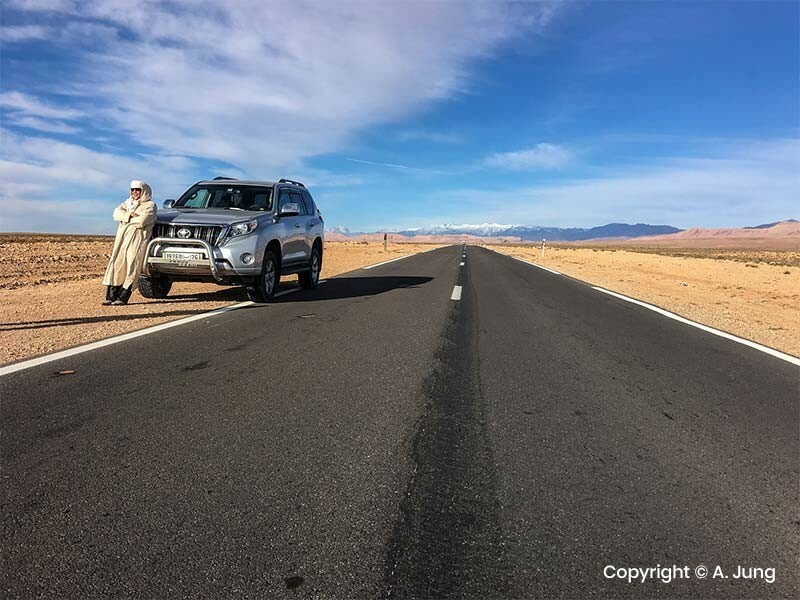 After breakfast today, we’ll drive to a checkpoint in the Merzouga desert. 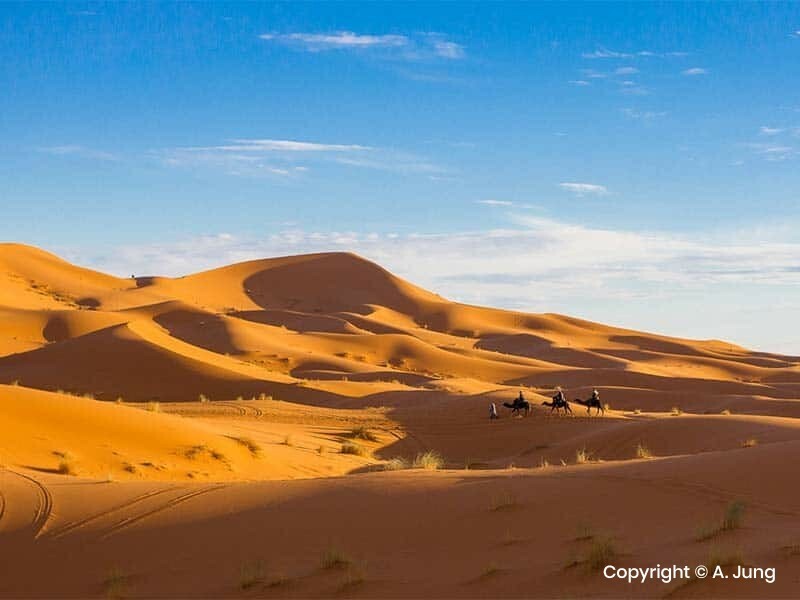 Upon arrival there we’ll trade in our 4x4 for camels (optional), guided by an experienced camel guide, and explore the region of Erg Chebbi. It’ll take us around 90 minutes to reach the campsite, once there, we’ll enjoy a beautiful sunset over the dunes and once dark, our dinner will be served around a campfire. This night will be spent in Berber tents in the desert. 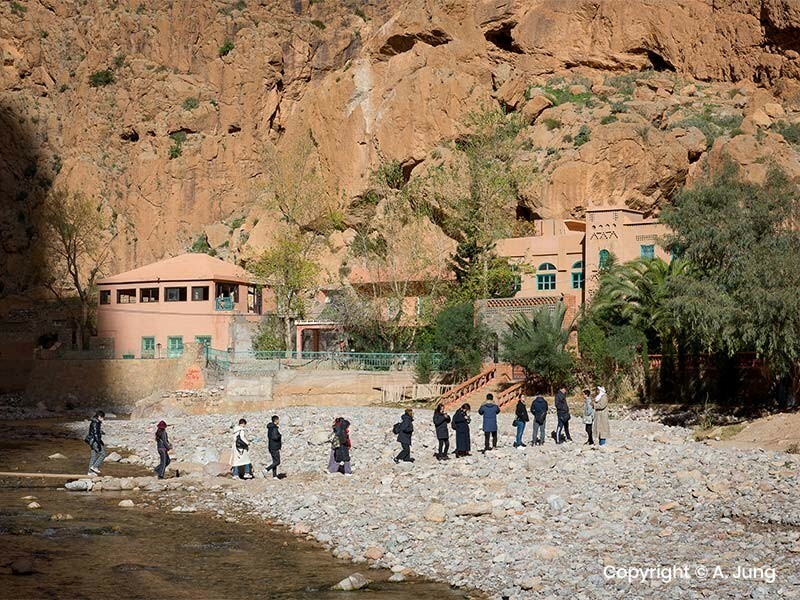 Our private tour continues with a drive towards Kalaat Mgouna and Ouarzazate, recognized as “the African Hollywood”. Here, we may visit the local film studio and Kasbah (Fortress). We’ll then head to Ait Ben Haddou, to visit the local Kasbah, the largest Kasbah in Morocco and a UNESCO world heritage site. We’ll continue over the High Atlas Mountains until we reach Marrakesh where we’ll spend the night at traditional Riad, in the medina. Today we’ll have a guided tour of Marrakesh. You will explore the main attractions and monuments of the city including the famous Jamma el Fna square, Kotubia mosque, the souks, palaces, and museums. We’ll also explore parts of the city such as Gueliz, The Menara Gardens and Marjolle. After lunch at a local restaurant, you’ll get the chance to explore the city at your leisure before retiring to a local hotel, where we’ll spend the night. Today we’ll have a guided tour of Essaouira, a city on the Atlantic coast, and then return to Marrakesh where we’ll spend the night once more. Today we’ll drive you to Casablanca where our tour ends.